I am the president of the young women's organization at my church, and I wanted to throw a holiday party to thank the other ladies who work on my board so hard to serve our girls. Finding an evening when everyone could come proved difficult, so I decided to have a weekday luncheon instead. All of us have little ones at home, so they were all invited to come and play together, (my little guy thought HE was having a party!) In all we had 6 ladies and 9 kidlets. Tomato Basil Bisque. Souper easy, and souper good! Just regular old canned tomato soup, only instead of water, use half 'n half. Then squeeze in some pre-chopped basil that you find in a tube in the produce section. Salt and pepper, of course, and it tastes like a million bucks! Really. I like to use it for entertaining (and great for feeding crowds!) People are always asking for the recipe and are always more pleased to find that it isn't much of a recipe at all. A trick I learned at the last baby shower I had where the kidlets were invited - Uncrustables, Capri Suns, and packs of pre-sliced apples keep the little guys perfectly happy with no work! They seemed to like them, but it was a bit hard to get excited when we were practically melting in 80 degree heat. I hope they get a chance to use them... someday. I made the pretty labels with SU's super pretty decorative papers, stamps, ribbon, and my Big Shot! What a great luncheon with some wonderful people! Those ladies were worth all the effort! I don't know what I'd do without them! When we were in school, we adopted our dear friend Carmen to be our California Grammy. She needed us and we needed her. In the kitchen she decided to go more playful and fun. She makes it a little dressier for the living room. Carmen decorates for the seasons because it makes her happy. She suggested that if you don't want to decorate the whole place, just make one spot in your home the "holiday or seasonal spot." When I was first married, she helped me (and handed down to me) decorations to use in "my spot" which was a table by my front door. Carmen also says "you usually know inside of you what looks good or not." I know what looks good but not always how to "get" that look. Maybe I'll figure it out this year. Thanks Carmen for your tour of all things Christmasy. Next time, you'll have to see her garden. It's amazing! Need something fun to do outdoors even if you have no snow? How about ice blocking? Grab some friends and family, a hill, a towel, gloves, clothes you don't mind getting grass-stained, and an ice block (sold at most grocery stores) and start cruising down the hills. Go down on your bottom or on your chest. It's a lot of fun especially followed-up with some hot chocolate. Watch out for those little ones in case you have a runaway ice block. They might be trying to get back up the hill with their sled. Have you seen these grass sleds before? Who says you can't sled in the grass? A Tree Full of Friends - Ornament Exchange Party! Every year, during the first weekend I December I gather my favorite ladies for one of my very favorite Christmas traditions - a handmade ornament exchange party. 12 dear friends each bring 12 of the same ornament and go home with 12 very different handmade ornaments for their trees. We eat and visit and just enjoy ourselves. I have one dear friend who moved a way but drives quite a distance to come every year with her ornaments. What is so fun is that every body's ornaments are so different - made from vastly different materials and skills. It is so fun to see what everyone comes up with and even more fun to get to take one of everything home! My kids can't wait to see what ornament I get each year, and it is so fun, year after year to fill my tree with ornaments made by the hand of my dear friends. I have over a hundred now that we have been doing it so long, and I can remember which dear friend made each one. my kids always ask, "Who made this one, Mom?" A tree full of friends. WE all bring our ornaments in a covered basket or bag, and when the time comes, we each take turns unveiling our ornaments, but usually only after we make our disclaimers about why our ornament didn't turn out like we planned, etc. We all do it - its pretty funny. But everyone is always so complementary, and the ornaments are usually terrific. But they are all made with love, so they are all always loved. At the end of the party I give them next year's theme, so they can start right away through the rest of the holiday season, and all year long, getting ideas for next year's ornaments. 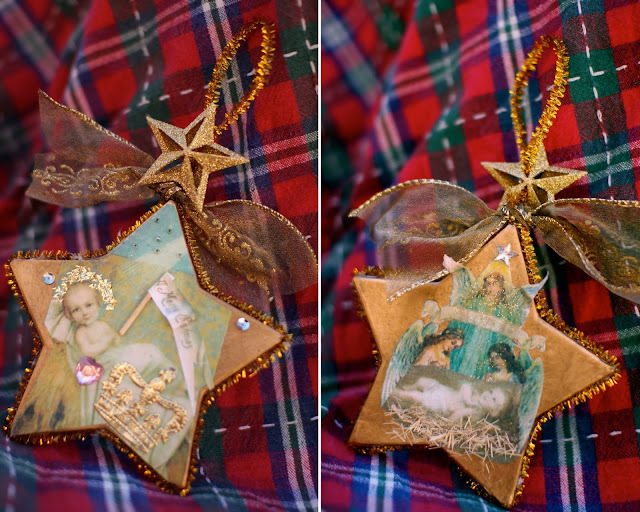 My ornament is the one above - a paper mache star decoupaged with vintage Christmas images. They were maddeningly frustrating to do because the new decoupage medium that I tried to use this time smeared and blurred the images terribly. Oh well. Wanna see what my girlfriends made? So fun! My friend Staci made the first one with sheets of galvanized metal, and vellum. I think is turned out really pretty, and the metal just gleams! My sister Lisa made the one above left. She blew up little balloons and wrapped starched string around them to make the lacy eggs. When her husband saw all the ballons drying on the counter he was a bit concerned. "You have made better ornaments in the past," he said. But once the were finished with little baby Jesus inside, they became just the cutest things ever. 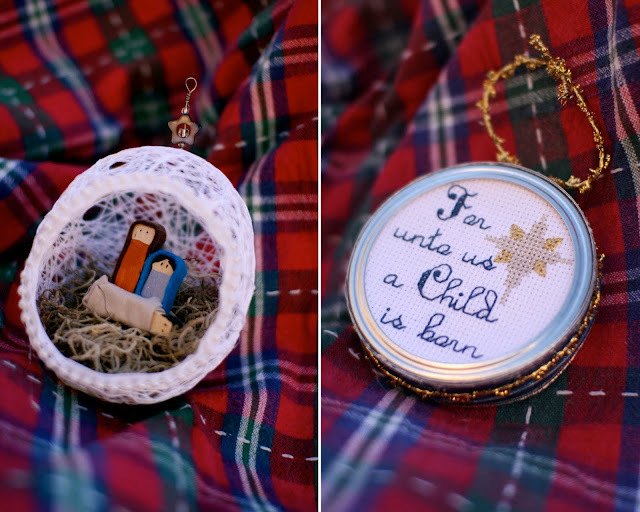 On the right, my friend Shannon, who is a talented cross-stitcher, stitched us these beautiful ornaments with metallic thread. She always does such fine work. A canning lid serves as the shiny hoop. 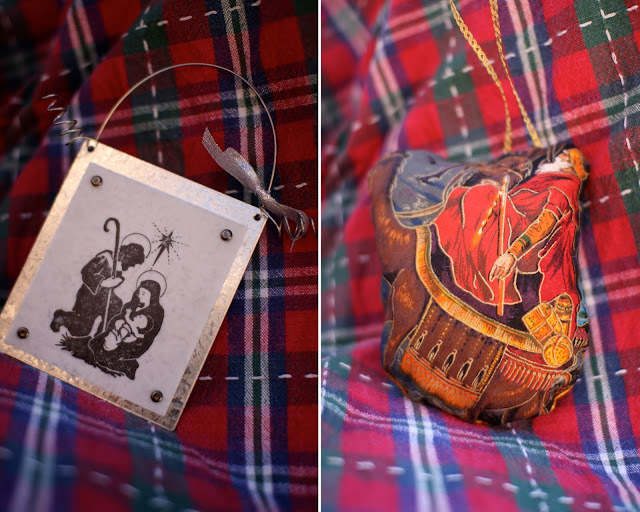 My dear friend Michelle, a talented seamstress made this two-sided ornament with her terrific embroidery machine. Red velvet! I love red velvet, especially at Christmas! Really great. Every year my devoted friend Kristi makes her ornament out of seashells. Just so clever. This is her second angel she has made over the years. She is incredible, her dress, head, and even wings are all shells. 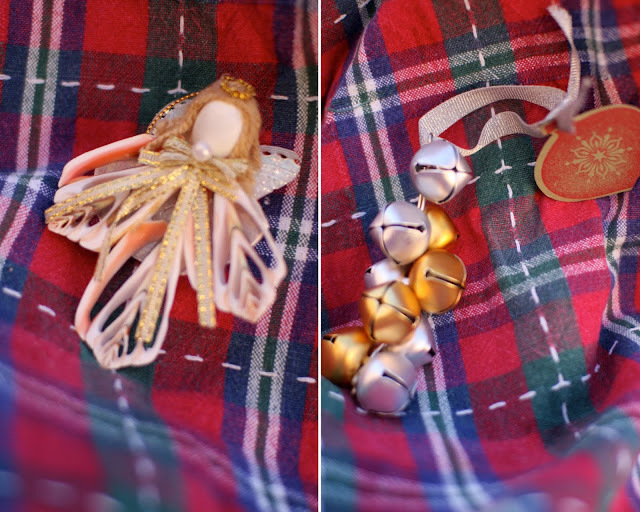 Dayna, who collects jingle bells, designed this clever ornament. The tag says "Gold was brought at his birth, Silver was traded at his death, "Ring in the Christ that is to be.'" She came up with that. I love it. My sweet friend Shea made these simply elegant porcelain ornaments stamped with Staz-On and embellished with a gold leaf paint pen. Mary, Joseph, and the babe on one side, and the three wisemen on the other. Beautiful! My dear friend Shari came up with this beautiful stained glass ornament. It too is stamped, andthe edges are foiled. It is so pretty with the light behind it! And finally, my sister-in-law Shirley! Her ornaments have gotten perpetually better over the years and are now nothing short of spectacular, thanks in big part to her hubby Mike, who is a genius with a scroll saw. He cuts them and all the pieces out, then Shirley disassembles each little piece, sands, sculpts and stains each piece, then puts them all back together like a jigsaw puzzle, glues it and varnishes it. Wow! That is a LOT of work! But I am so glad, because the results are stunning! So at the party she pulls our a baby Jesus ornament, and a Mary ornament, and a Joseph ornament. Everybody gasps and the question is asked, "How on earth will we be able to choose?" Her answer: "You don't have to!" She unveils her basket containing little tied-up bundles of a Mary, Joseph, and baby. We screamed! Lucky, lucky us! They could charge a fortune for those. That was truly a labor of love! This angel was the ornament they made for us last year. I went wild over it! Isn't she gorgeous! I hope they keep making pieces every year until we have the whole set! Every year, besides the ornament, I make my honored guests another gift that has to do with the theme. This year I made everyone these simple nativities. The bodies are made with 2x2 boards cut at 6in for Joseph and 5in for Mary. The heads are 1 1/2inch or 1 3/4inch wood balls. Baby Jesus is a piece of 2 inch lath, and a wood plug. 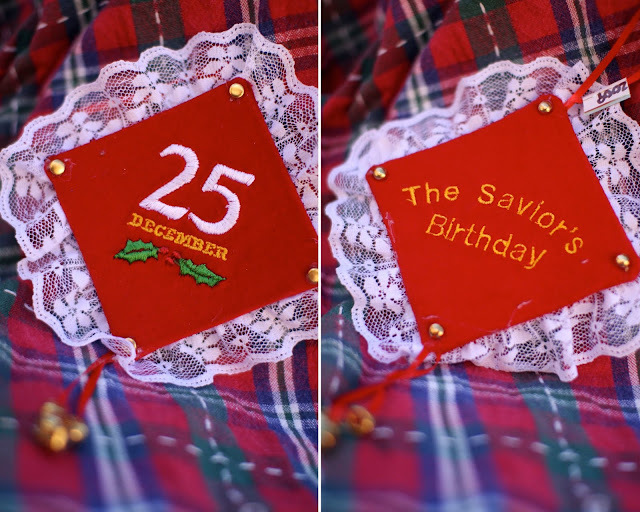 A little stamped tag reminds us of the true meaning of Christmas. Don't you just love this cute little family? Me too! Another wonderful year of great handmade ornaments and even better friends! Start an ornament exchange of your own, and before you know it, you'll be digging your ornaments Out of your Attic and have a tree full of friends too! Upon entering my home, our front table (which really is a dresser) houses this huge Nativity scene. (Excuse the flash in the mirror). I love nativities or better yet, creches. When I was growing up, my mom had them all through our house and our church use to have 100s displayed at Christmas time. I knew I wanted a good variety of them when I grew up. This Holy Family scene is placed in the middle of my home to remind my family that Christ should be the center of our lives. I LOVE, LOVE, LOVE this piece. I actually have this up all year-round. It's a great reminder of what the quote reads. I love this one. Can you believe my friend gave it to me years ago from Wally World? One of my favorites. African nativity. Again, a garage sale purchase. Isn't it beautiful? I just love the long and lean pieces. Here are some decorations that my children really love. When I was growing up, my mom decorated her mantle with nutcrackers. I've done the same. Each nutcracker represents our family members with their stocking hanging below (I noticed I'm looking sort of man-ish.) My children enjoy playing with these (naughty children) so hot glue has been a staple with these crackers. Guess who made this fun name tree for me? You guessed it. Rachelle. I'm so lucky to have a wonderful AND creative friend. Let her know if you want her to do a tutorial. We've got to have a bit of Santa in our decor. Here is my collection of Santas that I've collected through the years. Check out the Santa picture in the middle. Yes, Rachelle water-colored that for me one year. Am I lucky or what?? My brother-in-law carved this as a Christmas gift for me one year. It came with a whole story that talked about how this kitchen gnome will help my food taste good if I keep it close to where I am cooking. (Let's not ask my family if this is true or not.) Even though my brother-in-law has passed on, I think of him every time I look at this precious gift of time and love. Thank you for stopping by my home. Be sure to check out Rachelle's home by clicking here. Come back again to the attic soon, will you? Merry Christmas. The Nester is having a Christmas Tour of Homes linky party, and I am excited to add my house to the list! Click the button on the right to go over to her Nest and check out how other fellow bloggers merrily deck their halls. 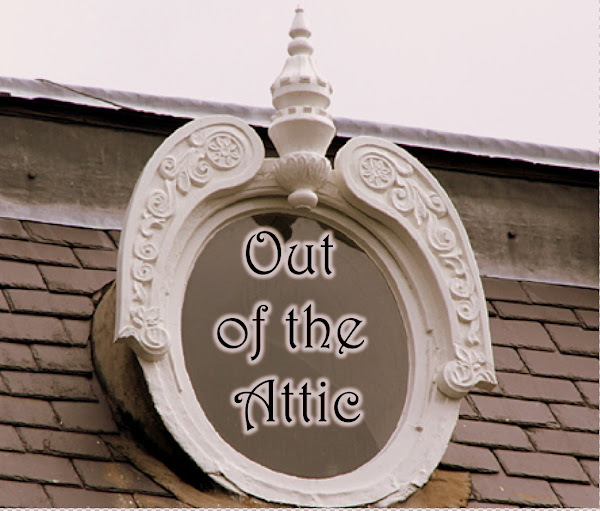 If you are new to Out of the Attic, WELCOME! We hope you have fun digging around up here in our attic, and find a treasure or two! Welcome into my home! I absolutely LOVE decorating for Christmas, and love the feel in our home when it is all decked out for the holidays! I always start decorating the day after Thanksgiving, and have it done by December 1st so we can just enjoy it all month long! The very first thing you see when you walk in my house is the very most important part of Christmas - the Christ child, of course. I display my collection of Nativities right in the entry way. I try to pick up a new nativity set every year. I have over 20 sets, some grand and some tiny. I love them all! The jewelry trees are also in a place of importance. My grandmother made the red one, and my husband's grandmother made the purple one, and I thought it was so neat that we both inherited them! Look up! There is a kissing ball! You better step aside before you get a big juicy one! Just to your left is our living room - all done in Gold and Glitz! 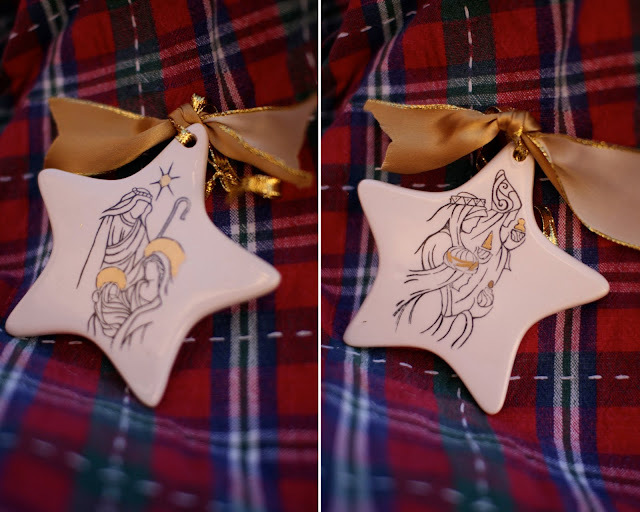 In my favorite corner are the wisemen with a mirrored star. Every year I paint a Christmas picture that I use for the front of my Christmas card. I frame them and hang them up a Christmas time. Do you like the gold and silver vintage ornaments in the apothocary jars? So did I, until my boys (I have 6 of them!) started horsing around. Anyway... happy thoughts... happy thoughts. What really makes me happy is my Christmas tree - gold and glitz to the extreme! Start with lots of ribbon, gold cord, and strings of chunky pearls. Then lots and lots of big gold glass balls, gilded mirrors, and a mass of ornaments, most of them homemade. Finish it off with a flock of clip-on glass and feather birds, and tendrils of more ribbon cascading down from the angel above. To your right, you will find the dining room all dressed up for the holidays, with chair covers made from table runners, and a sparkley sheer fabric layered over the table cloth. I put greenery and ribbon on everything. Really. Everything. This brings us into the kitchen/family room, where things are far less formal, and more fun. Our advent cabinet is popular around here, until all the candy disappears. Above is another of my Christmas paintings. The old wood sock stretcher hangs here all year, but at Christmas, it gets warmed up by an old stocking that someone once knitted for some guy named Guy. What a guy, that Guy! In the family room, all my snowmen sit among the milk glass in the cabinets and look down on all of us, while Santa and an elf perch on top. More vintage stockings over the TV. I love the candy striped ribbon over the piano! Also, by collection of old glass ornaments that I have found dirt cheap at garage sales over the years. The colors are great, and put me right into my happy place! We always have two trees. The one family room has all the ornaments my kids made, the ones my friends have made, and any other loved ornaments that just don't have the necessary gold and glam for the big tree. I just might like it more that the gold tree, because it is packed with memories! Over the fireplace are some old skis, an old sled, and a couple pairs of old ice skates. I have actually never had a white Christmas. They are purely decorative. But we can pretend that we have been out playing in the snow all day, right? So that is Christmas at our house! Hope you enjoyed it as much as I do! Thanks for dropping by our Attic! 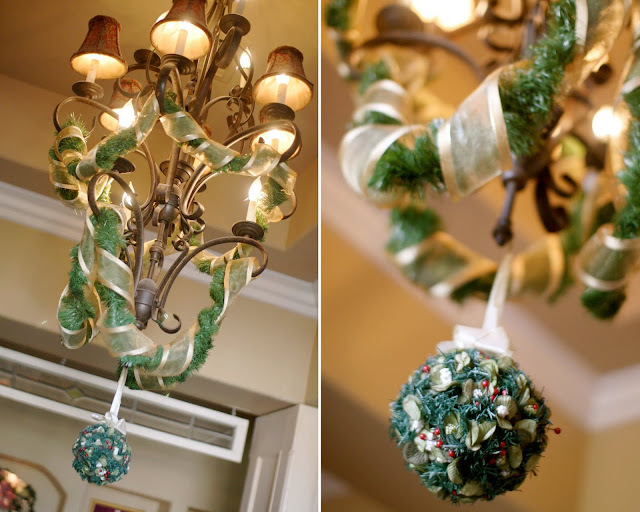 Be sure to check out Alysa's Christmas home here. Come back soon! ...and have a wonderfully Merry Christmas!